Delhiites are an exceptionally lucky lot. They are an island where every want from water to onions is met even before the morning dailies hit you with screaming headlines over shortages. The latest war cry in the national capital is against the VIPs, and the police deployed for their security. The city police commissioner maintains that security is provided on threat perception but there are few takers to his claim; the issue has become a statistician’s delight with the government admitting that there is one policeman for 253 citizens in the capital while twelve cops protect each of the 427 VIPs. Delhiwalas are more than a shade better than fellow citizens, say in Hyderabad or Chandigarh. Not only in matters of policing. In all matters of daily concern. This reality stuck me during my month long stay at Meherabad, a township that has come up in an erstwhile army camp near Arangaon village, on the outskirts of Ahmednagar city in Maharashtra. The place is famous for the Tomb Shrine of Meher Baba, who lived for long years at Meherabad. It is about 80 kms from Shirdi, the abode of Sai Baba. Though a top police functionary from Mumbai is a regular visitor to Meherabad, I did not notice much police presence in the area. There was a Beat Police Station in a pucca house but it appeared as a perennial silence zone. A van load of policemen descended on the area on Jan 31, the Amartithi of Meher Baba. Volunteers, mostly drawn from Andhra Pradesh, were scene handling the traffic and security drill for the 35 thousand pilgrims. It is possible that the organisers of the Amartithi wanted to keep security less visible. What struck an observant eye was the total absence of lathis and guns. Meherabad is a part of Marathvada region where parched lands and thirsty throats greet every visitor. The area has not received good rain in the last two seasons. In fact, it being in a rain shadow zone, rainfall is always scanty. Bore wells have almost dried up by the time I visited the area. Water is difficult to find at 500 feet even. Truck mounted boring machines from Andhra Pradesh and Karnataka are doing a roaring business drilling upto 600 ft though regulation depth is 250 feet. Water level in the reservoirs from Pune to Solapur has gone down forcing the Chief Minister Prithviraj Chavan to reserve available water for drinking purpose. Anti-corruption Ayatollah, Anna Hazare has implemented a water conservation and rain water harvesting scheme in his native Ralegaon Siddhi – a village that falls on Ahmednagar- Pune highway. The government, for a change, entrusted to him the task of replicating the success story across Ahmednagar district and even rest of the state of Maharashtra. 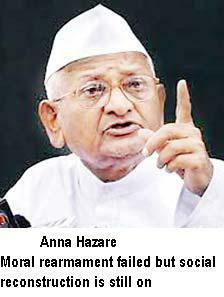 Sadly, Hazare’s quest for a larger role on the national scene resulted in the quiet death of his water conservation movement. That his nation-wide anti-graft crusade has made no headway is neither here nor there. Fact of the matter is that local Panchayats are not able to provide water – for animals and men alike. In Arangaon village, for instance, no water was supplied for most of December and even January. People are therefore forced to turn to water tankers. It must be said to the credit of Arangaon panchayat leadership that they too organised tanker supplies but it was not enough to meet the demand. Like always at times of water scarcity, the worst sufferers are cows, buffalos and other domestic animals. Dusting its old drought manual, the government has set up animal camps in more than 1200 villages. The manual decrees that such camps should not be for more than a fortnight and provides for a princely sum of Rs. 32 per animal. A classic case of governance deficit! A saying heard in Delhi is that rules are made for fools to follow and that the wise interpret them. Apparently, all wise men are in the nation’s capital, as Coalgates et al testify. If the ‘sarkar babus’ stick to the manual, and such a possibility is never ruled out in our deficit centric government, the sufferer will be the animal which doesn’t know what a PIL is. Consider this. Fodder is provided at the camp. There is no power to cut the fodder. Most farmers have deputed one or two persons to look after the ‘family silver’ by pulling them out of daily wage works. Prithviraj Chavan has knocked at the doors of Delhi Darbar. His visit coincided with unseasonal winter rains that left parts of Delhi water logged for long hours, and pulled down the mercury further. He presented an ‘invoice’ for Rs. 2270 crore to the Prime Minister. Visits to Delhi for bail-out packages have no more than symbolic value. Central aid is only advance plan assistance. That too is delivered after a central team goes around the affected state. All because our system of governance is based on mistrust. The central team is made up of IAS officers. And the team of officers they interact with is led by IAS officers. So, you have All India Service officers on either side of the Centre- State divide. Still, the practice persists. Years ago, in Hyderabad, S V Giri was the pointsman for drought relief work. During a briefing, I asked him about the rationale for visits of central teams to assess the damage. Soft spoken Giri simply smiled and continued with his narration. Years later, he moved to Krishi Bhavan in Delhi, where his job profile included deputing central teams to calamity hit pockets. This entry was posted in News and tagged Ahmednabafr, Ajit Pawar, Almatty Dam, anti-corruption crusade, Chavan, chief minister, hazare, maharashtra, Meherabad. Bookmark the permalink.